If Chelsea loanee Victor Moses takes to the pitch in Fenerbahce's Europa League meeting against FC Zenit Saint Petersburg on Tuesday evening, he would equal the appearances total for five Nigerian players. The Fenerbahce number eight is currently on eight appearances which he racked up at Chelsea and needs one more to join James Obiorah, Onyekachi Okonkwo, Onyekachi Okonkwo, Ubong Ekpai, Emmanuel Emenike and Efe Ambrose among the Nigerian players to have played nine games in the Europa League. Apart from Moses, only Ekpai is still active in the competition but he doesn't get a chance to play until February 14 when Viktoria Plzeň host Dinamo Zagreb. Including the old UEFA Cup, Nigeria's record appearance holder in the Europa League is Yakubu Aiyegbeni, who racked up 32 appearances in total for Everton, Middlesbrough and Maccabi Haifa, followed by Rabiu Afolabi and Wilson Oruma who both played 31 games each for four different clubs. Afolabi clocked up 2,732 minutes in the 32 games he featured in, more than any other Nigerian player in the competition. 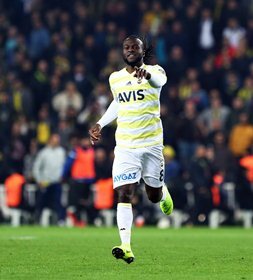 Moses was pictured training with his Fenerbahce teammates in their last workout on Monday and is in line to make his full debut against their opponents from Russia.